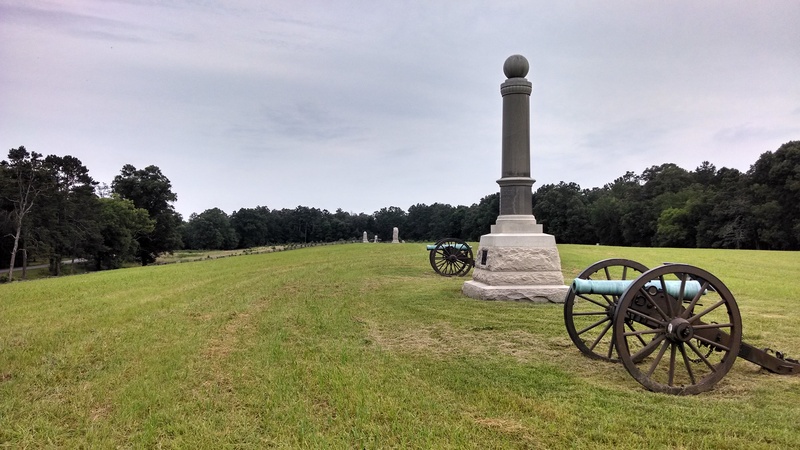 The Other Rock of Chickamauga? As some of you know, while the Chickamauga Blog remains my own project, I also post over on Emerging Civil War. One of the joys of research is turning an unexpected corner to find out something new. That happens every so often, and when it does, I always get a little buzz of excitement. Most recently, that buzz came when I stumbled across the name William W. Burns in the official records. 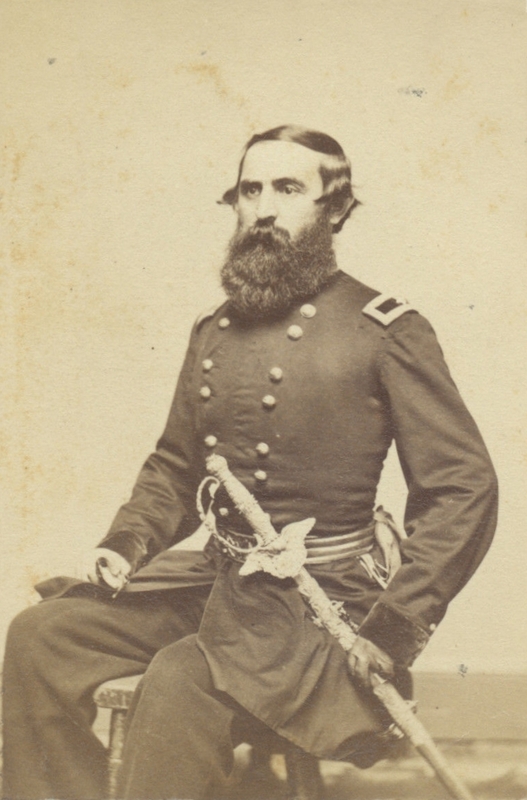 Now, Brigadier General William Wallace Burns was not exactly completely unknown to me: I knew he was a brigade commander in the Army of the Potomac in 1862, serving in the Second Corps under generals Sedgwick and Sumner; and later, a divisional commander in the Ninth Corps during the Fredericksburg campaign. He distinguished himself as a first-rate leader and capable fighter in the Seven Days’ battles of Savage Station and Glendale. He took a severe face wound at Glendale, not returning to the army until the fall, when he was stepped up to divisional command. But I was surprised to see him mentioned in a January 1863 dispatch sent by Union Major General William Starke Rosecrans to the War Department, inquiring about Burns’ availability for a command in the west. Burns was one of “several good officers” Rosecrans desired to have join his own command, the Army of the Cumberland. This is the stone of the fascinatingly-named Private Demon (also spelled Deman, or Demman) F. Allen, Company G, the 44th Illinois Infantry. Allen was mustered into Federal service at Chicago (Camp Douglas) in September 1861. 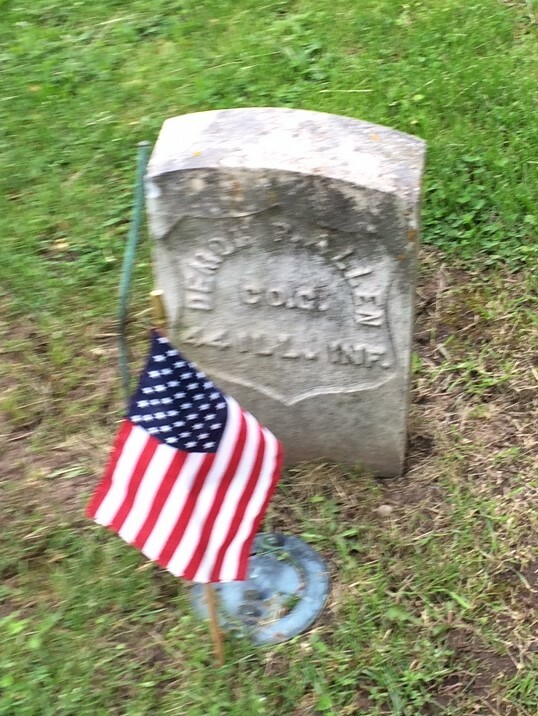 He re-enlisted as a veteran in February, 1864 near Chattanooga. He mustered out with the regiment on September 25, 1865. The truth is I don’t have much information on Pvt. Allen. The 44th Illinois produced no regimental history, and and the regiment itself came from scattered areas of the state. Allen was living in Howard, Illinois a hamlet in Fulton County (mid-state) but he joined Company G which was raised in Winnebago County, on the Wisconsin line. When he re-enlisted in 1864 his residence was recorded as New Milford, which was in Winnebago County, just south of Rockford. He applied for a pension in December 1884 on grounds of being an invalid. I haven’t found any evidence of his being wounded in action, but that is not uncommon for pension applicants; far more men applied on the basis if injury or disease than because of battle wounds. I do have an interesting letter from Captain Alonzo M. Clark, who commanded Allen’s Company in action on September 20, 1863. 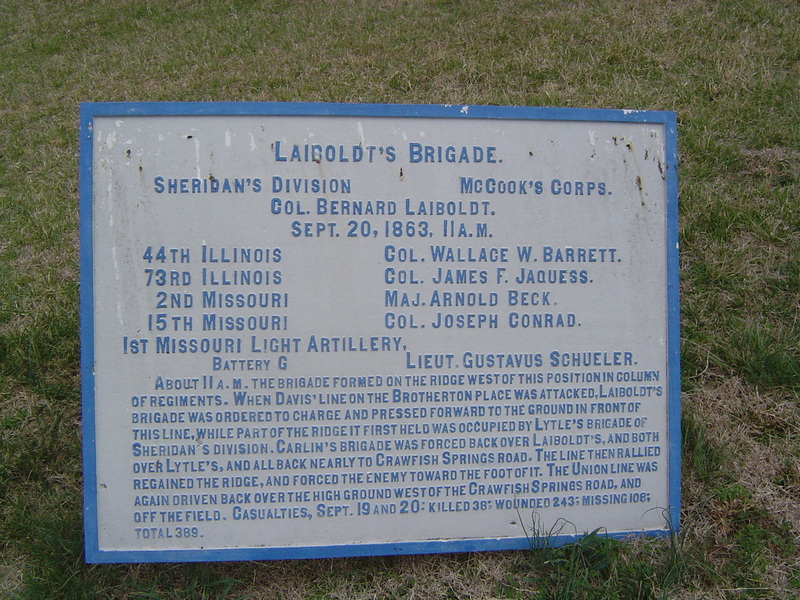 The 44th was part of Laiboldt’s Brigade, which was unfortunately ordered by Major General McCook to charge down the slopes of Lytle Hill into the teeth of an oncoming Confederate division despite being improperly deployed. the 44th – along with it’s brother regiments the 73rd Illinois, 2nd and 15th Missouri, suffered severely. I don’t know for sure if Private Demon Allen was one of those who rallied around the 8th’s flag, but I like to think he was. 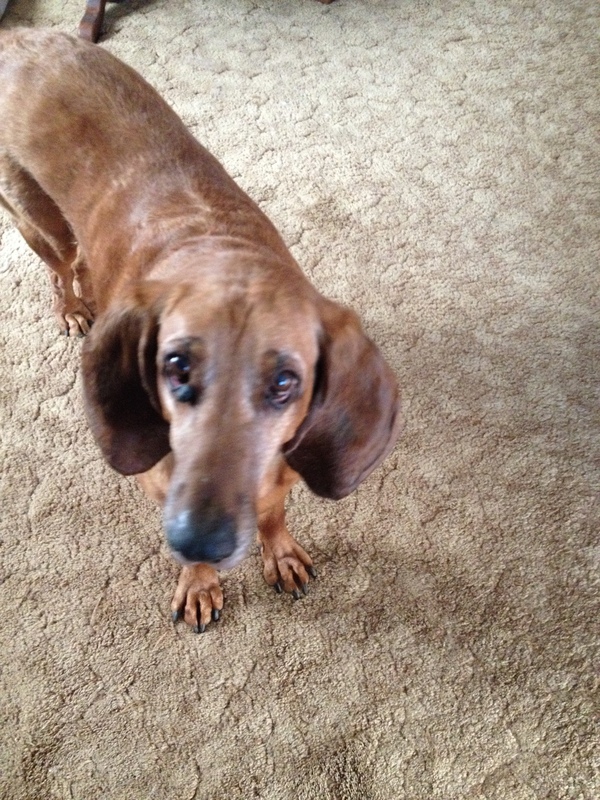 Killian and I thank you for your service, Private Allen. I’ve been away a while. I’ve sort of been digesting the publication of Volume 3, and all the work entailed in the entire Chickamauga Campaign Trilogy over the past three years. Back in 2010 I posted about Union Brigadier General Walter Whitaker, speculating on whether or not he was drunk on Horseshoe Ridge, September 20, 1863. At the time I concluded that I didn’t find the accusation credible, but I did note that there were other such accusations. One such charge was lodged against the Kentuckian at in the Battle of Lookout Mountain, November 24, 1863. 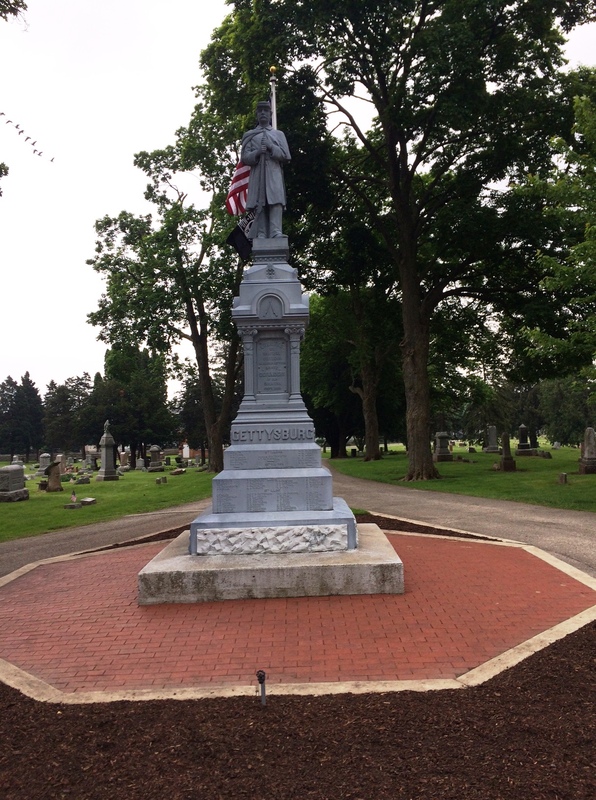 In that engagement, Whitaker’s brigade supported Brigadier General John W. Geary’s division of the Union 12th Corps. Geary’s men swept the western and northern faces of the mountain clear of Mississippians belonging to Edward C. Walthall’s brigade, charged with defending Lookout’s lower plateau. Near the end of that fight, as Geary’s division bogged down near the Cravens House, Whitaker’s regiments charged through Geary’s line – mainly through the New Yorkers of Col. David Ireland’s brigade – to outflank a newly arrived brigade of Alabamians. One of those New Yorkers was Lt. Albert R. Greene of the 78th New York, Aide-de-Camp to Col. Ireland at the time. Greene went on to insist that Ireland’s men never saw any relief, that no other troops supported them during the battle, and further, that Ireland had no idea that there were even any troops deployed to support them. All in all, curious charges. Leaving aside for the moment the question of their commander’s degree of inebriation, the historical record is pretty clear that Whitaker’s men were engaged at the Cravens House. They certainly suffered losses in about equal proportion: Geary reported 138 casualties out of about 2400 engaged; while Whitaker’s 6 regiments lost 82 men out of roughly 1450 engaged. (Even Geary’s own reported noted 52.) The regimental reports clearly reflect a spirited fight. Several regimental accounts mention Whitaker being in the thick of that action. It is impossible to square Greene’s account with the Official Records or the histories of those regiments who participated in the fight. It’s true that neither Geary nor Ireland give Whitaker much mention in their own reports, but some of Ireland’s regiments do a better job of describing Whitaker’s involvement, and the regimental reports from Whitaker’s brigade offer considerable detail as well. And herein lies the trouble with Greene’s anecdote, as colorful as it is. Greene is clearly mistaken on virtually every detail of what happened at the Cravens house. He reserved full and complete credit for all the fighting to Ireland’s men, ignoring almost every other Federal on the mountain. His account is easily refuted by copious evidence to the contrary. And if he is so wrong about all those details, why should we assume he is spot on with regards to Whitaker’s drunkenness? Especially since it is not supported by any other account? Now I suspect that Whitaker had a reputation for being a man who liked his bourbon – he was a Kentuckian after all. But so did many other officers; It was an era when drinking was much more acceptable – as long as you did not appear incapacitated. It is interesting to note that in his modern work on the 6th Kentucky Infantry, the regiment Whitaker commanded before stepping up to a brigade, historian Joseph Reinhart found no accounts of Whitaker being intoxicated. So what prompted Greene’s claims? Well, there was the matter of two Confederate cannon captured at the Cravens House, first by Ireland’s men, and then by two regiments of Whitaker’s line. Cannons were always trophies, and time and again, we see post-battle disputes arising between rival claimants. Then there is the matter of Easterners Vs. Westerners; Geary’s 12 Corps men came west to “save” the defeated Army of the Cumberland troops, who later strongly insisted that they did not need any “saving.” Rivalries can be persistent. So once again I am left with the same conclusion: I really don’t know if Whitaker was too drunk to command his men effectively on November 24, 1863; but I don’t feel Greene’s account accurately describes what happened at the Cravens House either. Such are the small mysteries and loose threads of history’s tapestry.